As part of my day down at Chatham Dockyard, which I will write about in a day or two (as I am too tired right now), we went inside a submarine! 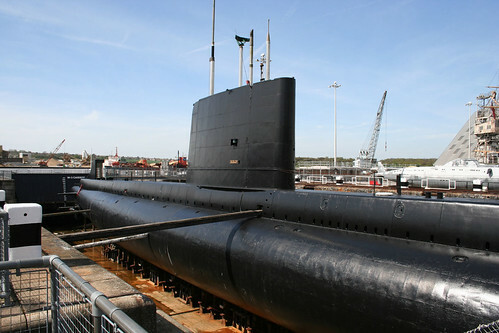 In a dry dock is HMS Ocelot, an Oberon-class diesel-electric submarine which put to sea in 1964 and was operational throughout the cold war until 1991 – when nuclear powered submarines suplanted them in their entirity. When the submarine was decomissioned most of the radar kit was removed, presumably as it is still sensitive, and even to this day its sea missions are still classified. It is incredibly cramped in there – nothing you have ever seen on a movie cannot prepare you for how utterly claustrophobic the place is. 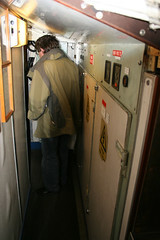 The humans are slotted in to the submarine, almost as an annoying afterthought. Considering that there are nearly 70 people in this tiny space, one thing which surprised me is how “mechanical” the interior is with pipes, handles and switches all over the place. Quite how they didn’t keep switching things off by accident when trying squeeze past each other is beyond understanding. Oh, and thanks to the lack of space, each sailor was permitted just one change of clothes for an eight week patrol. Week one, underpants front to back – week 2, swap to back to front. Week 3, inside out front to back then week 4, swap around to inside out and back to front. Week 5, switch to spare undies and repeat the process. On sponge wash per week, if you are lucky. As you can imagine – it stank in there, but as everyone smelt the same no one actually noticed. It was a quite facinating tour – and the tour guide was good without being patronising about dumbing down (our group had no kids, which probably helps!). Loads of photos at the usual Flickr location. As I said, I was down there for a whole day – and we were getting a “behind the scenes” tour – which I will write about later. That’s awesome. I’m originally from Norfolk Virginia – home to the largest US naval base. 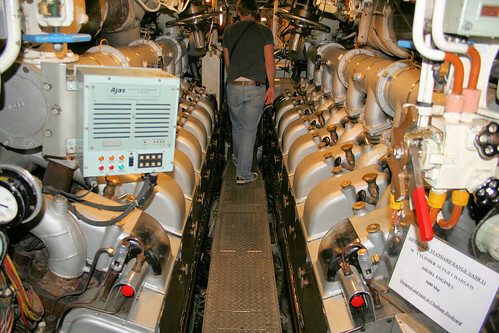 I once got a tour of one of a sub like this and another time on an aircraft carrier. It was huge! The pictures definitely don’t do justice to the size. Thanks for sharing. Hi Pal, I served on the Ocelot from 83 to 90 and was the SPO. Don’t know who told you the dit about change of clothes but it was rubbish.We were able to wash our clothes periodicaly especialy when the Distiller was working and latterly when we had the reverse osmosis machine for the falklands trip. Will need to go and visit it some time. I agree with tug, I was on Ocelot 76 to 78 as a Sparker, the “Nicks” dit is about as true as the one about throwing socks at the wall to see if they stuck. We didn’t have reverse Osmosis when I was on board but what the hell you could still have a “Bird Bath” every Sunday. I was on the Oracle and Odin and we did not have an RO plant. Good people with some good times.